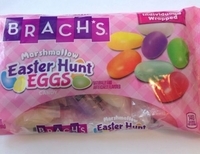 Brach's marshmallow Bunny Basket Eggs also called Easter hunt eggs. Marshmallow eggs with a fruit flavored pastel candy coating and A Favorite old time Easter Candy. These are not only a perfect Easter Basket Stuffer, but also a great Easter treat for placing in your Easter Eggs or to decorate your bunny cake with. You get approximately 15 individually wrapped marshmallow Easter hunt eggs per bag.